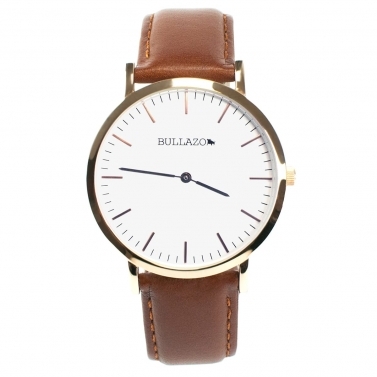 The absolute MUST HAVES of a modern and fashion-conscious gentleman include mens leather watches. It should be as flat as possible so that it does not appear disturbing and conspicuous underneath the shirt, jacket or sweater. For a classic men's watch that embodies the elegance you want both in business and pleasure, we also recommend analogue watches with a minimalist design. Coloured classics for everyday business are the combinations silver-black or silver-brown. If the occasion becomes a little more sophisticated and refined, or if you just want to set an accent, then the combinations with the rose gold men's watch are particularly well received. 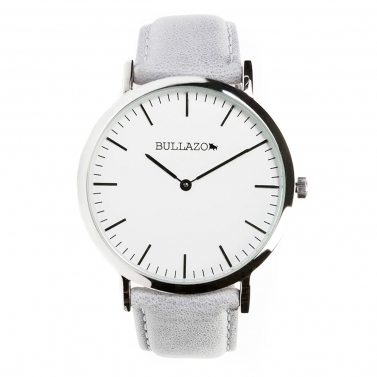 All colour combinations are recommended for the casual look, the grey mens leather strap watches respresent out personal highlight of the season. How do you make the right choice from a wide range of watch models? 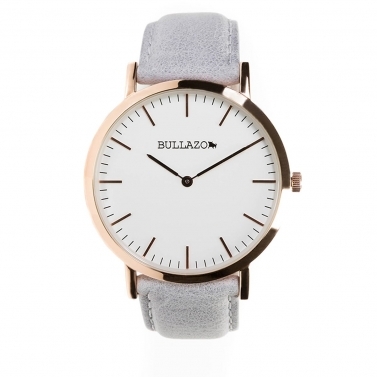 With the BULLAZO leather strap watches, we have placed particular emphasis on classic modern elegance and timeless design. For the modern businessman it is important to dress discreetly chic. Today, no longer do magnificent, overpriced watches score as accessories, but much more minimalistic accents. And especially underneath the jacket, a shirt or a tight pullover it's important to have a thin, flat mens' watch! Adapt to the right style at any time. Especially in business, the outfit is important and you should make sure that the leather strap of the watch matches the belt and shoes. With the practical wristbands for changing BULLAZO, this is no longer a problem. Exchangeable leather wristbands can be replaced easily and without any extra tools or pins. We attach particular importance to the classic colours that permeate our entire collection: black, brown and finally silk grey for the watch straps.